Tomorrow at 2:30 another hearing is taking place. Judge Hill will probably declare Michael Cadena in direct criminal contempt even though she couldn’t locate a precedence for doing it. I plan to attend, Judge Hill needs an audience to witness her activism. This case has many twists and turns. I’ve read thousands of pages of police and other reports. Without re-reading much of it, I could not put together an exact timeline. 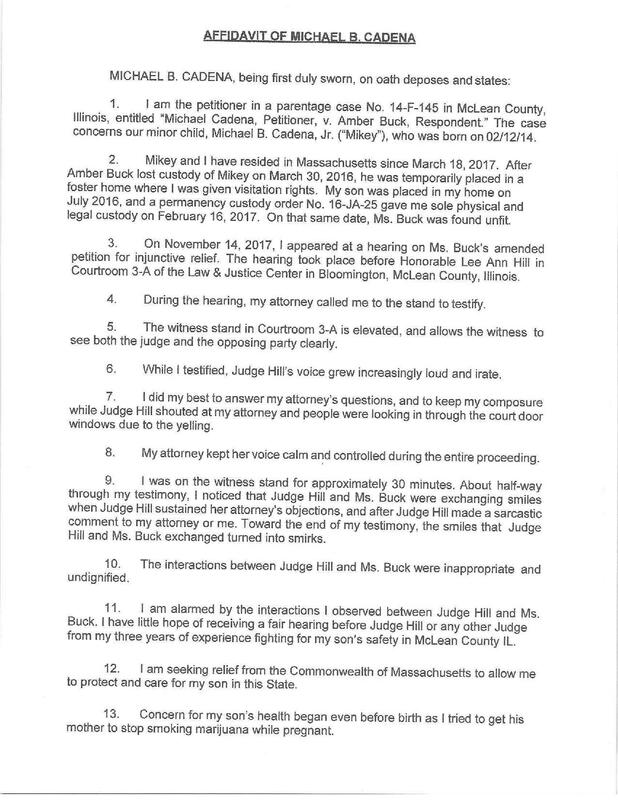 Instead, I am posting what Michael Cadena filed in Massachusetts. It contains a timeline from his perspective, it explains why he fled Illinois. If you don’t understand the case, this will help. Posted in BloNo, Bloomington, Liberal Media, Local.Tagged Amber Buck, Judge Hill, Massachusetts court, Michael Cardena, MIkey Cardena. I’ve only got one thing to say – WHY is this even a case??? If all of that above is factual. His mother has absolutely NO BUSINESS having him in her custody, and I don’t care how much money her family has, she is not responsible enough to have a fish tank IMO, let alone a young child. #26 is enough to keep her from EVER having custody of ANY living being! 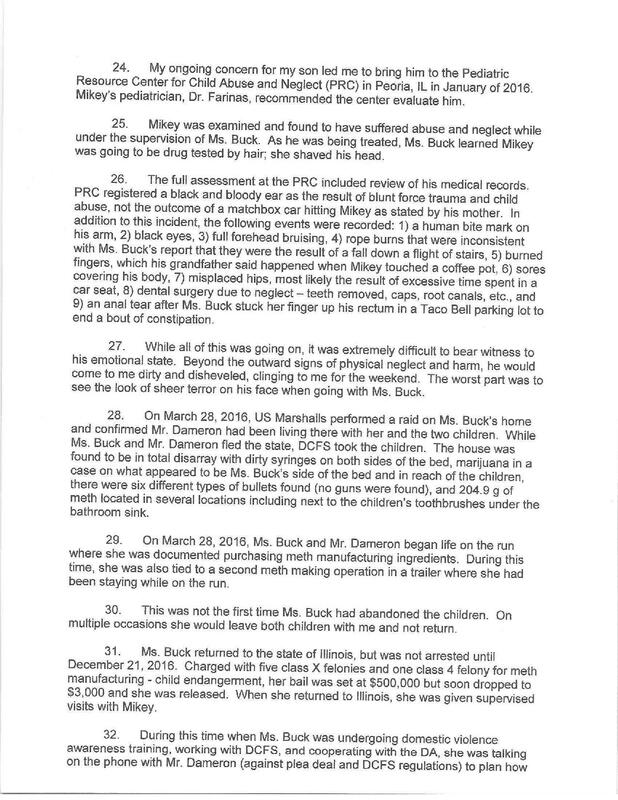 I am still dumbfounded that no child abuse or neglect charges were ever filed by the county. Especially after the children were removed by authorities for living in a meth lab with other drugs and ammunition. Has anyone else read the public police reports for this woman? Shocking. 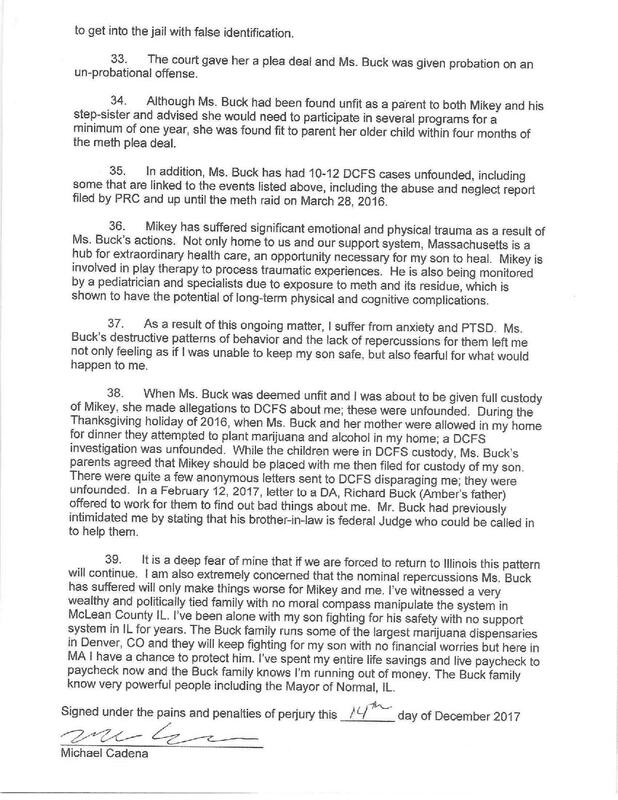 How is a judge giving custody back to her? All because the father is refusing to bring the son back to Illinois? Would you? I hope Massachusetts takes jurisdiction and the justice department does an internal investigation into McLean County. They say that Justice is blind but in this case it is also deaf, dumb and stupid. Who is the Guardian Ad Litum on this case for the child? Give this man his son back. What is wrong with these people? This man has been fighting for his son and most men could care less. If they want what is best for this child give him to his dad who loves him. Yes, who is the GAL in this case? It might be beneficial to have a CASA assigned to the case as there appear to be many inconsistencies in the case and rulings. I also do not see why the states attorney has not made an appearance in this case. We are only hearing his side of the story, but it does sound fishy. WOW! Tyler and Amber lived next door to us in an apartment house on East Jefferson street here in Bloomington. I thought they were a nice couple I talked with Tyler often, I even paid Tyler to clean out the gutters on our house. When I started thinking something was wrong is when a neighbor lady told me that when Tyler leaves of a day there was a guy that goes in their back door to be with Amber and he is known as known a druggie. Then one day after Tyler had left Colin showed up and told me that he was the father of Amber’s daughter and had moved in with her and that Tyler had been arrested for receiving 5 pounds of Pot in the mail and he would be going to prison for a few years. I will say though Tyler did a good job of landscaping around their apartment and always seemed to be a nice person in fact we have had several neighbors at that apartment house next door to us before they moved in much worse then them! This seems like the kind of case where the dad might perform a mercy killing on the kid. (Not a prediction, and certainly not advising he do so, I just wouldn’t be surprised to hear about it after he definitively learns that McLean County courts sometimes actively endorse child abuse.) Too bad Hill et al would never be prosecuted as accessories like they should be. This is heart breaking. I need to know that poor child is doing alright. Has anyone been in contact with this child since the return to the women? I’m trying to understand a very important part of this whole process, because it’s what has put a target on Michael’s back. How is it that Michael left Illinois with little Mikey after being awarded custody? Was it full custody or? Did he need the courts permission to move to another state as the court of Illinois is claiming? If he did, why did he move? And what did his lawyer at the time advise that he do? He asked his lawyer twice by email and never received an answer. He felt in danger so he left.